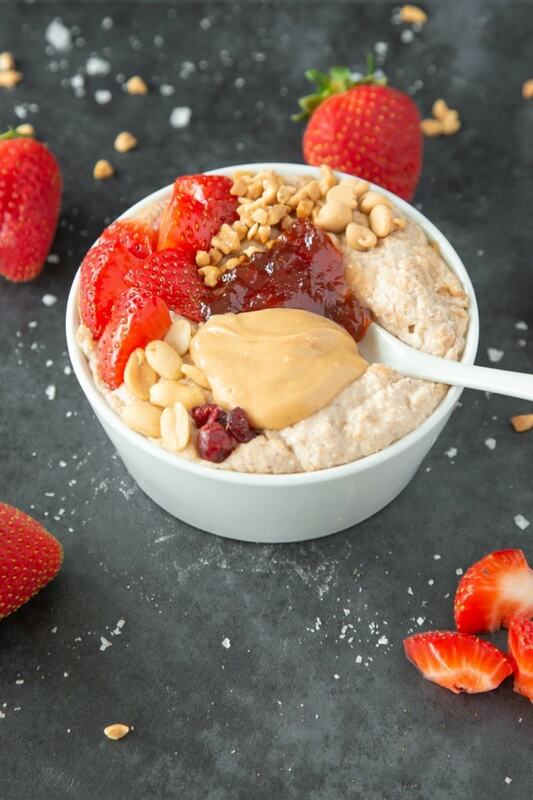 Enjoy dessert for breakfast, with this strawberry cheesecake inspired overnight oats recipe! Packed with protein and with a hint of dairy free cream cheese swirled into it, it’s a healthy breakfast. 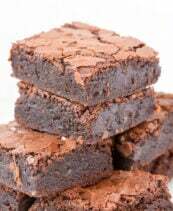 Naturally vegan and gluten-free, it’s also completely keto and paleo friendly too. We love our low carb oatmeal recipes here. We’ve had oatless chocolate oatmeal, cookie dough oatmeal, and carrot cake oatmeal. 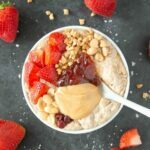 This strawberry cheesecake overnight oats recipe may be my new favorite! 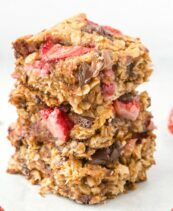 Smooth, thick and creamy, these strawberry oats stick to your ribs and keep you satisfied all morning! Packed with protein and healthy fats, you’d be surprised that they are super low carb! Instead of using oatmeal in the base, a combination of ground flaxseed, chia seeds, shredded coconut, and creamy coconut milk are used to substitute it. Are oats paleo and keto? I often get asked if rolled oats are suitable on a paleo or keto diet and the answer is no. Oats and other grain/cereal products are not approved on either diet. They are considered too processed, wheat-based, and also contain too many carbohydrates. 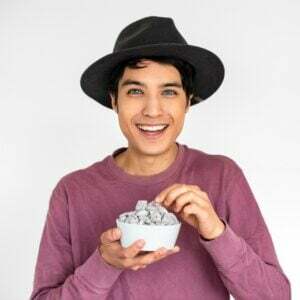 Are steel cut oats paleo and keto? Like rolled oats, steel cut oats are also not suitable for either of these diets. Even though steel cut oats require much less processing, at the end of the day, it is still a grain. Step 1: In a shallow bowl or container, add your dry ingredients and mix well. Step 2: Add your milk of choice and mix well, until combined. Step 3: Place the overnight ‘oats’ mixture in the refrigerator for several hours or overnight, to thicken up. Step 4: Remove from the fridge- The ‘oats’ should be incredibly thick. Slowly add extra milk until your desired texture is achieved. Step 5: Stir through your coconut yogurt or cream cheese and strawberries. Top with desired toppings and enjoy! 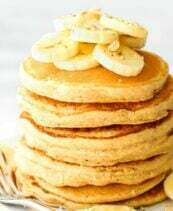 Can I use oats if I don’t follow a keto/paleo diet? If you don’t follow a ketogenic or paleo diet and can tolerate oats, you can easily use that instead! 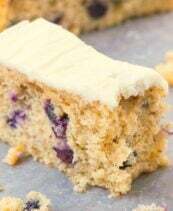 Sub out all the dry ingredients, except for the granulated sweetener of choice, and replace it with half a cup of gluten-free rolled oats or quick oats. 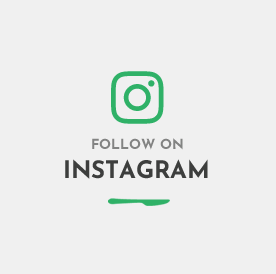 Follow the rest of the instructions as above and enjoy! Use the milk of choice needed as a guide. Depending on the type of chia seeds and shredded coconut you use, sometimes you’ll need more than the recommended amount. Feel free to use either fresh strawberries or frozen strawberries. If you use the latter, simply thaw to room temperature, before adding into the oatmeal. If for some reason your oatmeal is too thin, add extra chia seeds to thicken. I used white chia seeds to keep the oatmeal lighter in color, but black/dark ones are fine to be used too. To take this oatmeal up a notch, consider using full-fat coconut cream instead of the coconut milk (I used half cream and half milk). Avoid heating up oatmeal, as it will yield a gummy texture. You can easily breakfast prep this strawberry oatmeal. Makeup to 5 portions at once, and enjoy throughout the week. Sans cream cheese/yogurt, it will keep for at least 1 week. 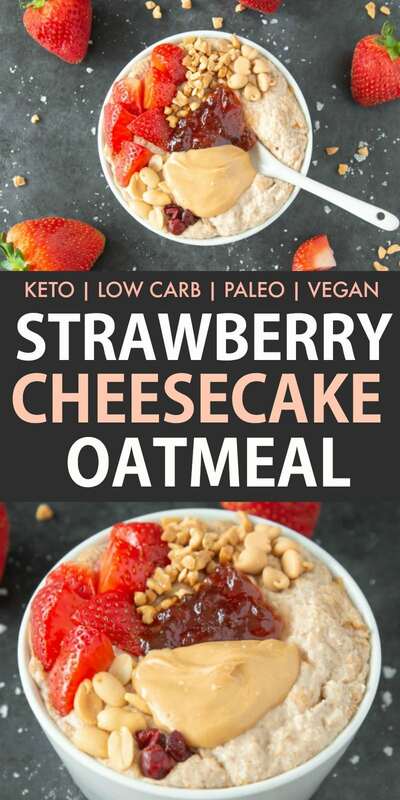 This healthy strawberry cheesecake overnight oats are made without oats, without dairy and is super low carb and keto friendly! 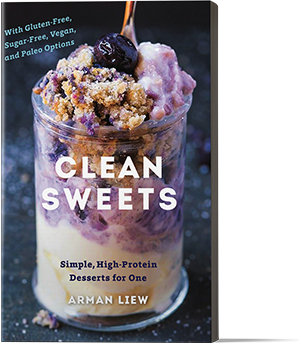 It's protein packed, vegan and paleo! In a shallow bowl or container, add your dry ingredients and mix well. Add 1/4 cup of your milk of choice and mix well. Refrigerate. The next morning, remove the 'oat' mixture from the fridge. Add extra milk until a thick and creamy texture remains. 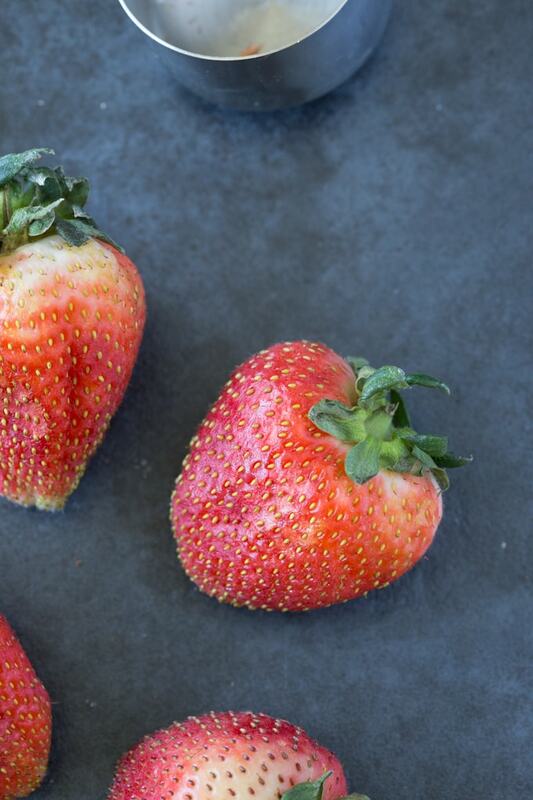 Add your strawberries and cream cheese (or yogurt) and mix well. Top with your favorite toppings and enjoy! 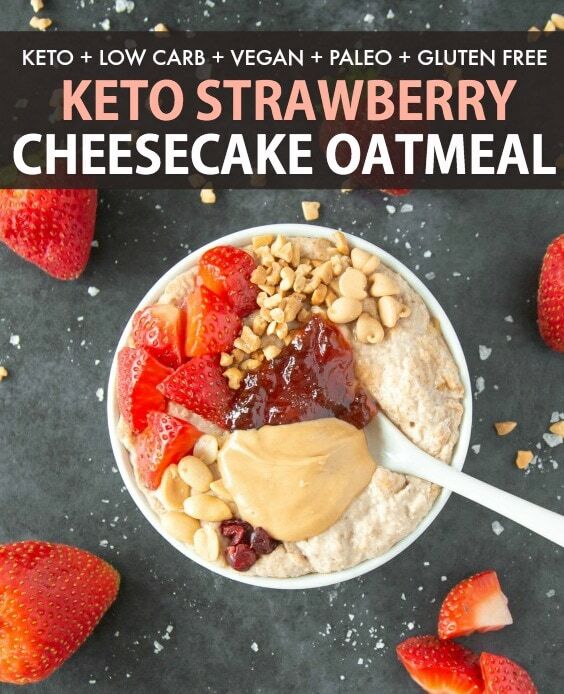 Vegan Strawberry Cheesecake Overnight Oats (Keto, Paleo) can be made in advance and refrigerated until ready to enjoy. Just be sure to not stir in the yogurt/cream cheese until just before eating. This sounds wonderful! I have flaxseed meal and almond flour, so I’m hoping that substituting the chia seeds for more flax seeds would work!